There's an old quote that comes out the early labor movement: "First they ignore you. Then they ridicule you. And then they attack you and want to burn you. And then they build monuments to you." From the heat coming off the attacks from ed journalism's junkyard jackass opinionator, Jon Alter, there is a fire now being stoked by the Billionaire Boys Club, where an inability to buy the truth has reached a crisis point that demands that the truth tellers, now, be burned at the stake.
. . . .Railing against the tyranny of tests is fashionable, but it isn't going to save our children and our economy in the 21st century. Nor will more money for important programs like art and music. The more basic problem is that we have no way of determining which teachers can actually teach. That's right: teaching is arguably the only profession in the country with ironclad job security and a well-honed hostility to measuring results.. . .
. . . .General elections are won among moderate swing voters, many of whom would respond well to a Democratic candidate willing to show he can slip the ideological stranglehold of a retrograde liberal interest group. Obama's right that the NCLB-inspired testing mania is out of control, but wrong to give teachers "ownership over the design of better assessment tools." That's a recipe for no assessment, because the teachers unions, for all their lip service, don't believe their members should be judged on performance. They still believe that protecting incompetents is more important than educating children. . . . .
Obama should hold a summit of all 50 governors and move them toward national standards and better recruitment, training and evaluation of teachers. He should advocate using Title I federal funding as a lever to encourage "thin contracts" free of the insane work rules and bias toward seniority, as offered by the brilliant new superintendent in Washington, D.C., Michelle Rhee. . . . He [Gates] called President-elect Obama last week and reports back cheerily that Obama "said all the right things" about including big money for education in the stimulus package and making fundamental school reform (not the fake kind pushed by teachers unions) a priority. . . . When I lumped Gates in with the "bomb throwers" on education, he chuckled and didn't disagree. There’s a backlash against the rich taking on school reform as a cause. Some liberals figure they must have an angle and are scapegoating teachers. But most of the wealthy people underwriting this long-delayed social movement for better performance are on the right track. I can see them, all former Corps (TFA) members, sipping lattes and hugging their clipboards around the table at the Gates Foundation and singing KIPP Shall Overcome. Arne Duncan, President Barack Obama’s normally mild- mannered education secretary, has finally had enough. “Diane Ravitch is in denial and she is insulting all of the hardworking teachers, principals and students all across the country who are proving her wrong every day,” he said when I asked about Ravitch this week. Eight pro-Ravitch comments were posted at the Bloomberg site before they stopped taking any more, even though hundreds of anti-Alter tweets have been posted. I hope everyone reading this has a hundred characters or so to say on the matter. The conflict of interest inherent in having a media company owned by a powerful politician would probably be easier to explain away if that media company's new opinion arm refrained from directly attacking prominent critics of the boss. But Bloomberg View, like Bloomberg himself, doesn't care what nitpicking critics say. 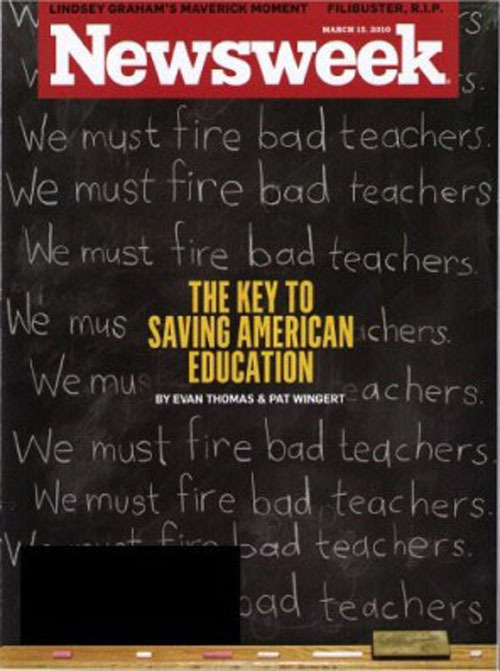 That's why no editor there thought it unseemly of Bloomberg View to run a Jonathan Alter piece attacking education policy expert Diane Ravitch, a vociferous critic of Mayor Bloomberg's handing of the New York City schools system. Bloomberg View is the unasked-for opinion arm of Bloomberg L.P., the financial information company founded and owned by the billionaire mayor of New York City. Before it launched, one of its editors promised that it would run only "ideology-free, empirically-based editorial positions about the pressing issues of our time," because the ideology of the wealthy elite does not count as ideology. There was already a minor controversy when it was reported that the opinion arm of Bloomberg's media company — a company he is not supposed to be directly running while he's mayor — would be located not at corporate HQ, but at the offices of the Bloomberg Family Foundation, where the mayor is allowed to participate in day-to-day operations. Alter, formerly of Newsweek, is no lazy hack. He is smart and hard- working. Mayor Bloomberg didn't directly assign some shameless attack dog to go after one of his critics. Alter obviously sincerely agrees with the Bloomberg philosophy. But it still looks seriously inappropriate, like Mayor Mike's P.R. department firing off a response to this recent Ravitch op-ed. And Alter's piece is not very impressive or convincing! It basically says that Alter and his friends are right and Ravitch is wrong, and it is full of very un-self-aware passages accusing her of caricature while very clumsily caricaturing all of Ravitch's arguments. When Alter says Ravitch "uses phony empiricism to rationalize almost every tired argument offered by teachers unions," we're meant to hiss at the invocation of the bad guy in this story. "Phony empiricism" means "data that contradict data used by pro-reform sources." Like the data that showed that the miraculous test score gains made by New York school children after two terms of complete control of the school system by Mayor Bloomberg were illusory. But it's fine for Alter to disagree with Ravitch or accuse her of misusing statistics or insulting hard-working MBAs opening up for- profit charter schools across this great nation. It's just doesn't seem right to read this side of the argument under the name "BLOOMBERG." I wrote a response and posted it on the site — and was soon joined by scores of others, almost all scathing. Then came the next round of responses, on the blogs of educators around the country. Alter has been given a shellacking he will not soon forget. And the paragraph that perhaps inspired the most heat was the one where he quoted Arne Duncan, who said, "Diane Ravitch is in denial and she is insulting all of the hardworking teachers, principals and students all across the country who are proving her wrong every day." I have worked in the high-poverty schools in Oakland, California, for the past 24 years, 18 of them as a classroom teacher. I have a firsthand understanding of what works, and what does not. Making a fetish out of test scores, and spending endless hours poring over test score data, does not work. It just makes teachers focus narrowly on test scores at the expense of real learning. Labeling school s as failures and firing key staff does not work, it just creates an atmosphere of fear -- but that seems to be one of the key weapons in the "reform" arsenal. We WILL do better when we let go of the illusion that mandates and tests will improve our schools. That we can simultaneously improve an institution while systematically denigrating and disempowering the professionals who work there. We will do better when we recognize the importance of stabilizing a teaching staff, and giving them time and space, and respect for the critical collaborative work they need to do to improve. We will do better when we fund our schools properly, so they do not have to choose between a library and a nurse. Or worse yet, where they have neither. We will do better when education policy makers take the time to listen to people who work in our schools,and not 'reformers' funded by billionaires. Ten years ago, Congress adopted the No Child Left Behind legislation, mandating that all students must be proficient in reading or mathematics by 2014 or their school would be punished. To prove that poverty doesn’t matter, political leaders point to schools that have achieved stunning results in only a few years despite the poverty around them. But the accounts of miracle schools demand closer scrutiny. Usually, they are the result of statistical legerdemain. In his State of the Union address in January, President Obama hailed the Bruce Randolph School in Denver, where the first senior class had a graduation rate of 97 percent. At a celebration in February for Teach for America’s 20th anniversary, Education Secretary Arne Duncan sang the praises of an all-male, largely black charter school in the Englewood neighborhood of Chicago, Urban Prep Academy, which replaced a high school deemed a failure. And in March, Mr. Obama and Mr. Duncan joined Jeb Bush, the former governor of Florida, to laud the transformation of Miami Central Senior High School. But the only miracle at these schools was a triumph of public relations. Mr. Obama’s praise for Randolph, which he said had been “one of the worst schools in Colorado,” seems misplaced. Noel Hammatt, a former teacher and instructor at Louisiana State University, looked at data from the Web site of the Colorado Department of Education. True, Randolph (originally a middle school, to which a high school was added) had a high graduation rate, but its ACT scores were far below the state average, indicating that students are not well prepared for college. In its middle school, only 21 percent were proficient or advanced in math, placing Randolph in the fifth percentile in the state (meaning that 95 percent of schools performed better). Only 10 percent met the state science standards. In writing and reading, the school was in the first percentile. Gary Rubinstein, an education blogger and Teach for America alumnus who has been critical of the program, checked Mr. Duncan’s claims about Urban Prep. Of 166 students who entered as ninth graders, only 107 graduated. Astonishingly, the state Web site showed that only 17 percent passed state tests, compared to 64 percent in the low-performing Chicago public school district. Miami Central had been “reconstituted,” meaning that the principal and half the staff members were fired. The president said that “performance has skyrocketed by more than 60 percent in math,” and that graduation rates rose to 63 percent, from 36 percent. But in math, it ranks 430th out of 469 high schools in Florida. Only 56 percent of its students meet state math standards, and only 16 percent met state reading standards. The graduation rate rose, but the school still ranks 431st, well below the state median graduation rate of 87 percent. The improvements at Miami Central are too small and too new to conclude that firing principals and teachers works. To be sure, the hyping of test-score improvements that prove to be fleeting predated the Obama administration. In 2005, New York’s mayor, Michael R. Bloomberg, held a news conference at Public School 33 in the Bronx to celebrate an astonishing 49-point jump in the proportion of fourth grade students there who met state standards in reading. In 2004, only 34 percent reached proficiency, but in 2005, 83 percent did. It seemed too good to be true — and it was. A year later, the proportion of fourth-graders at P.S. 33 who passed the state reading test dropped by 41 points. By 2010, the passing rate was 37 percent, nearly the same as before 2005. What is to be learned from these examples of inflated success? The news media and the public should respond with skepticism to any claims of miraculous transformation. The achievement gap between children from different income levels exists before children enter school. Families are children’s most important educators. Our society must invest in parental education, prenatal care and preschool. Of course, schools must improve; every one should have a stable, experienced staff, adequate resources and a balanced curriculum including the arts, foreign languages, history and science. If every child arrived in school well-nourished, healthy and ready to learn, from a family with a stable home and a steady income, many of our educational problems would be solved. And that would be a miracle.